Do not remove the fuel pressure sensor from the fuel delivery pipe sub-assembly. If a fuel pressure sensor is removed, replace the fuel delivery pipe sub-assembly with a new one. (a) Remove the fuel delivery pipe sub-assembly (See page ). (b) Check the fuel pressure sensor output voltage. 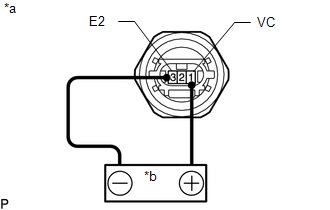 (1) Apply 5 V between terminals 1 (VC) and 3 (E2). Be careful when connecting the leads, as the fuel pressure sensor may be damaged if the leads are connected to the wrong terminals. 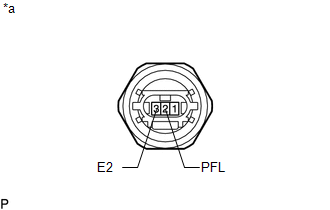 Do not apply more than 6 V to terminals 1 (VC) and 3 (E2). If a stable power supply is not available, use 4 1.2 V nickel-metal hydride batteries or equivalent. (2) Measure the voltage between terminals. If the result is not as specified, replace the fuel delivery pipe sub-assembly. (c) Install the fuel delivery pipe sub-assembly (See page ). Perform "Inspection After Repairs" after replacing the fuel delivery pipe sub-assembly (fuel pressure sensor) (See page ). If a fuel pressure sensor is removed, replace the fuel delivery pipe sub-assembly (fuel pressure sensor) with a new one.